At session after session at Davos, executives have been grappling with the question: Is there anything that the world’s corporations can do about this scourge that threatens the political, social, and economic sustainability of our democratic market economies? The answer is yes. It begins with a simple idea: pay your taxes. This is the first element of corporate responsibility. Don’t resort to shifting taxes to lower tax jurisdictions. Apple may feel that it has been unfairly singled out on this score; it only did a slightly better job at tax avoidance than others. Don’t make use of the secrecy and tax havens, onshore or offshore, whether it’s Panama or the Cayman Islands in the Western hemisphere or Ireland or Luxembourg in Europe. Don’t encourage the countries in which you operate to engage in tax competition, a vicious race to the bottom where the real losers are the poor people and ordinary citizens around the world. A second idea is equally simple: Treat your workers decently. A full-time worker shouldn’t be living in poverty. In Scotland, 31% of households where one adult works full time are still in poverty. Top executives in large US corporations now take home around 300 times what the same corporation’s median worker receives. That’s far more than in other countries or at other times — and the disparity can’t be explained simply by productivity differentials. In many cases, corporate CEOs take home so much simply because they can — doing so at the expense not only of their workers but of the long-term growth of the company. Henry Ford understood the idea about good pay, but his wisdom seems to have been lost on some of today’s corporate executives. Around the world, there are many corporations, led by enlightened leaders, who have long understood these maxims. They have understood that it is in their enlightened self-interest for there to be shared prosperity. Rather than lobbying for policies that increase rent seeking — with their corporate gains coming at the expense of others — they have realized that the only sustainable prosperity is shared prosperity, and that in those countries afflicted with ever growing inequality, the rules will have to be rewritten to encourage long-term investment, faster growth and shared prosperity. That sounds good to me. Alas, re-writing the rules means changing the laws in the direction Stiglitz smartly advocates for. Not exactly going to happen under Trump and the Republican Congress. DeVos has strong backing among Republicans, but the rocky outing damaged her reputation and her ability to make a case (hers and the incoming administration’s) for school choice and expanded charter schools. Moreover, the DeVos and Tillerson hearings should give Republicans pause about the competency of the administration. They will be the ones to cast votes for candidates who did not appear prepared; they’ll be the ones to get flak if DeVos doesn’t perform well. They may tire at some point of bailing out the White House if the new administration cannot do the bare minimum to help its own nominees. Finally, the shoddy preparation provided to those new to government service may discourage others from accepting spots. Who wants to accept a bid to go into government if your new boss sets you up to fail? Poll after poll shows the public disapproves of the Trump transition and his nominees. Hearings like the one last night do not exactly inspire confidence. Like it or not, when Trump’s nominees do poorly, his standing with the public (rightfully) suffers. The argument for hiring businesspeople and others outside government rests on the proposition that smart, competent people in one field can do well in another and bring new ideas and energy to government. The Trump team undercuts that argument when its ill-prepared nominees don’t sound informed or competent. Maybe both Trump and his nominees need to be put through their paces by people who respect the complexity of policy issues and the importance of the departments and agencies that they will be leading. And please, please, don’t try to argue that CNN– a network which paid money to Corey Lewandowski, among others– is in any way the liberal equivalent of Fox. 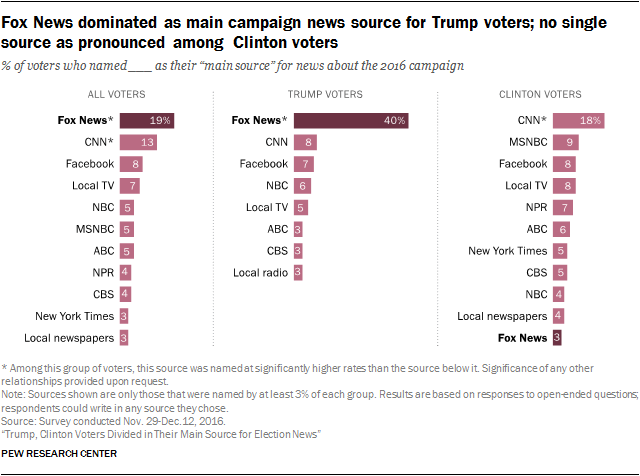 When it comes to the Republican electorate, it’s clearly a Fox News world.